You can open multiple PDFs in different tabs in the Reader mode. If you would like to open the same papers in the Reader tabs that you had open last time before you closed Papers, go to File > 'Reopen Reader Tabs From Last Session'. 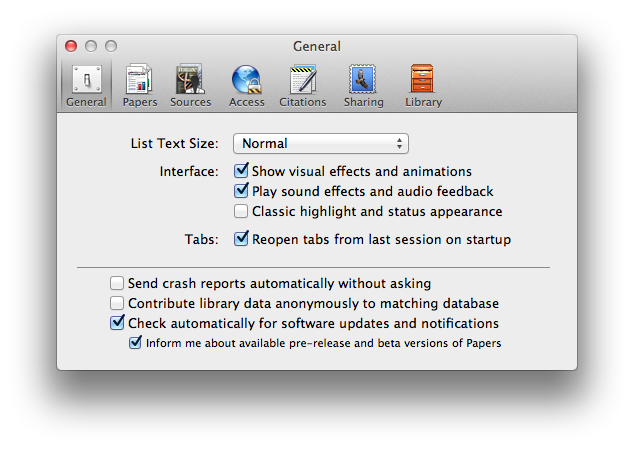 In addition you can set Papers to always open tabs from the last session in the preferences. You can rearrange the order of the tabs in the Reader screen by dragging the tabs. If you open more than six tabs in the Reader, you can only see the last six articles in the Reader tabs and the rest are hidden behind a three dotted icon. If you want to close a publication that is one of the hidden tabs, you can close it by selecting the publication and using the keyboard shortcut Shift + Cmd + W.